several other teams were already pushing the Suns to get back involved in a deal for Ariza, including the Los Angeles Lakers and Houston Rockets, league sources said. 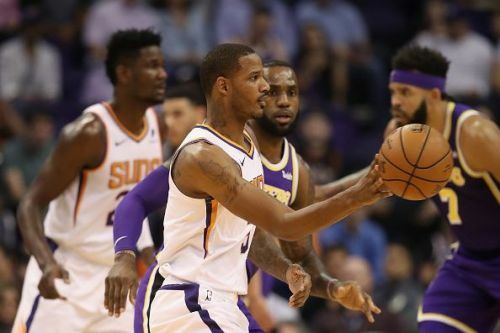 Trevor Ariza was a free-agent last summer, and instead of staying with the Houston Rockets, he opted to join the Phoenix Suns on a one-year $15 million deal. The small forward has averaged 34.5 minutes, 9.9 points, 5.6 rebounds, and 3.3 assists per game so far this season, and he has continued to demonstrate his status as one of the NBA's better two-way players. Due to signing a new contract in free agency, Ariza only became eligible for a trade today, and it looks as though Ariza will not be a Suns player much longer. The 33-year-old clearly doesn't want to spend the rest of the 18/19 season with a team that currently has a dismal 5-24 record, and the organization is also keen to offload his contract. Ariza has already been part of both the Lakers and Rocket's rosters in the past, and it is clear that both teams believe that he could boost their postseason playoff hopes. Ultimately, it will come down to which team puts together the best trade package together, in order to entice the Suns. The Houston Rockets will tonight take on the Memphis Grizzlies, as they look to force themselves back into playoff contention. Meanwhile, the Los Angeles Lakers will be looking to bounce back from their defeat to the Rockets, as they face the Charlotte Hornets. Should the Lakers sign Carmelo Anthony?